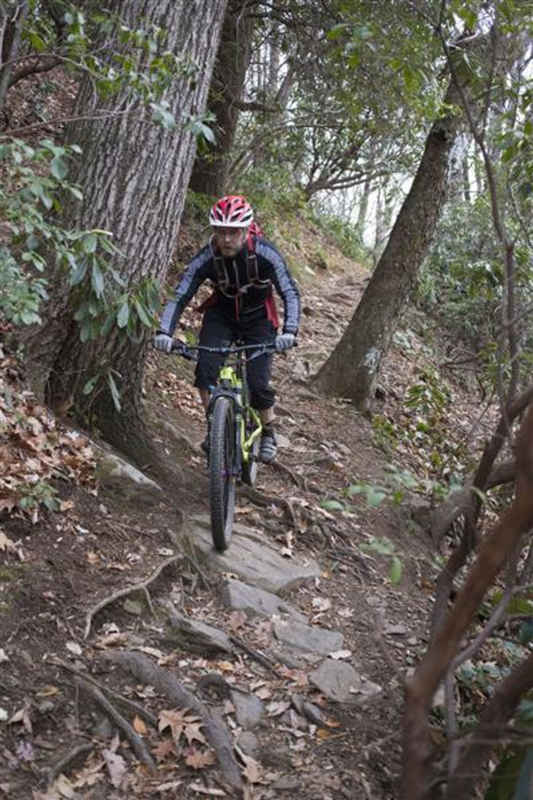 The Cove-Daniel loop is a classic intermediate Pisgah mountain bike ride, and one of our favorites. You’ll climb Cove Creek Trail and some old forest roads before a thrilling, rocky downhill on the west side of the Daniel Ridge Loop Trail. This 12-mile route includes about 1,500 feet of climbing. 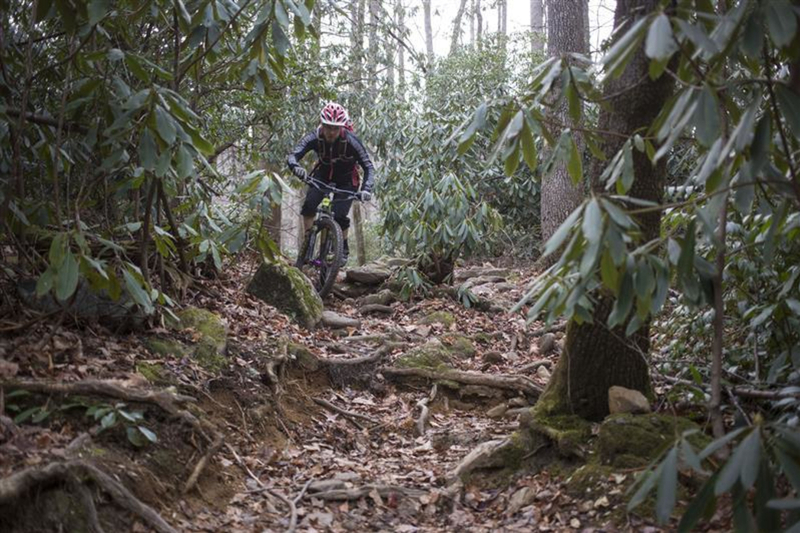 While Cove Creek is a fun downhill for beginner mountain bikers, and Daniel Ridge can be ridden as a short loop on its own, the combined Cove-Daniel loop is a classic intermediate Pisgah ride and one of our favorites. You’ll climb Cove Creek and some old forest roads before a thrilling, rocky downhill on the west side of the Daniel Ridge Loop Trail. 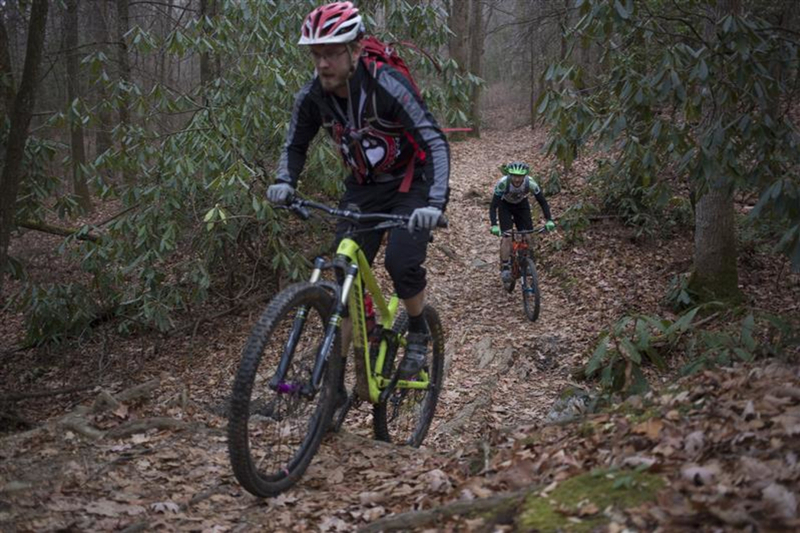 This 12-mile ride includes about 1,500 feet of climbing. 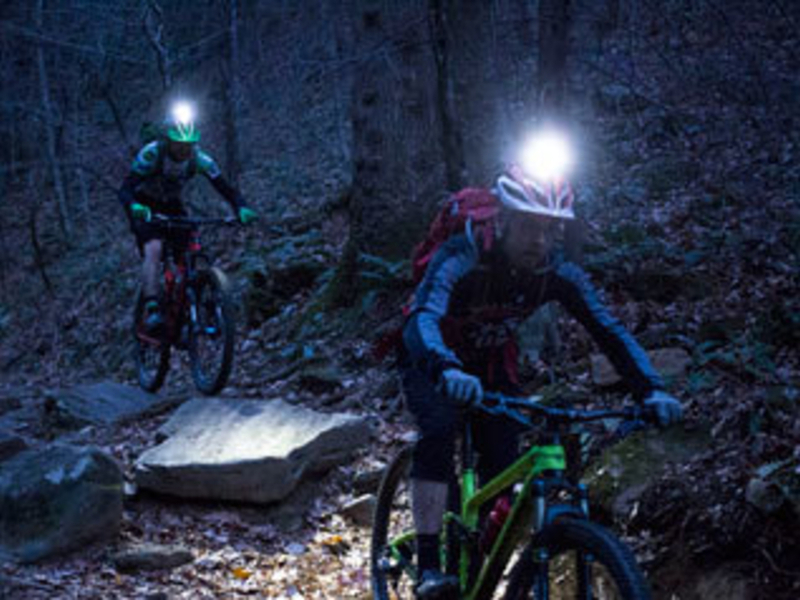 This route is also, as is typical with Pisgah mountain biking, riddled with many junctions, not all of which are signed. This loop is not for the navigationally-challenged! Carry a good trail map, and don’t be shy about stopping to take a look. To begin, park at the Bobby N. Setzer State Fish Hatchery in the Pisgah National Forest. You can reach the fish hatchery by following 276 from Brevard into the forest, then turning left onto FS 475; follow signs for the Pisgah Center for Wildlife Education. There is a large parking lot here, restrooms and a water fountain, though the bathrooms are closed after-hours and on Sundays. Head back onto the pavement out of the Hatchery parking lot, across the small bridge, and take a left. You’ll climb the road for a short distance, then take your first trail on the left-hand side through a gate. This is the Davidson River Trail (TR 650), which climbs a slope high above the river, and coincidentally saves you from a horrible climb on the pavement above! When the Davidson River Trail rejoins 475, keep left, and look for signs for Cove Creek Group Camp on your right. Go through the gate here, then stay left to cross a creek instead of continuing toward the Group Camp. You’ll climb a gravel road for about half a mile until seeing a sign on your left for Caney Bottoms Trail (TR 361). Take this. Most of Caney Bottoms is closed to bikes, but this short section is open for mountain bikers to access the Cove Creek Trail. After a minute or two of pedaling, be sure to take the unsigned right-hand turn down some log steps and across a creek into a clearing. This begins Cove Creek (TR 340). 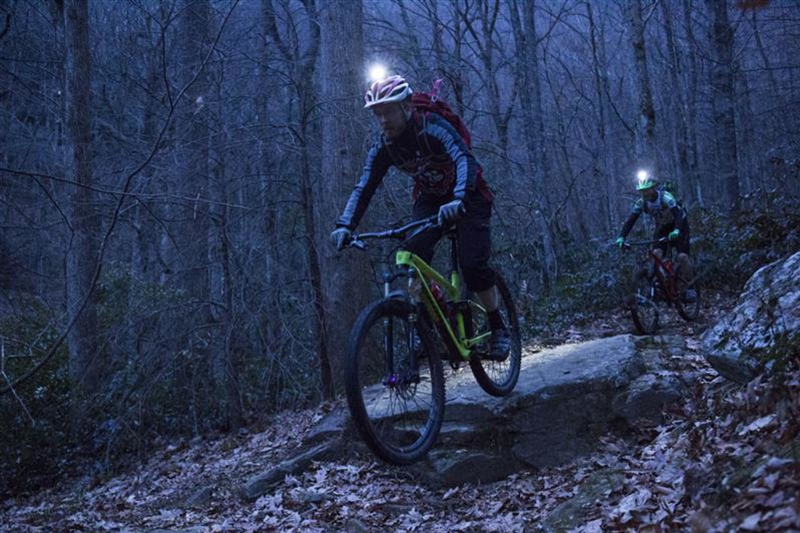 Cove Creek is a classic Pisgah trail, and the climb is pleasant, never too brutally steep and with some fun obstacles along the way. Practice those lifts! 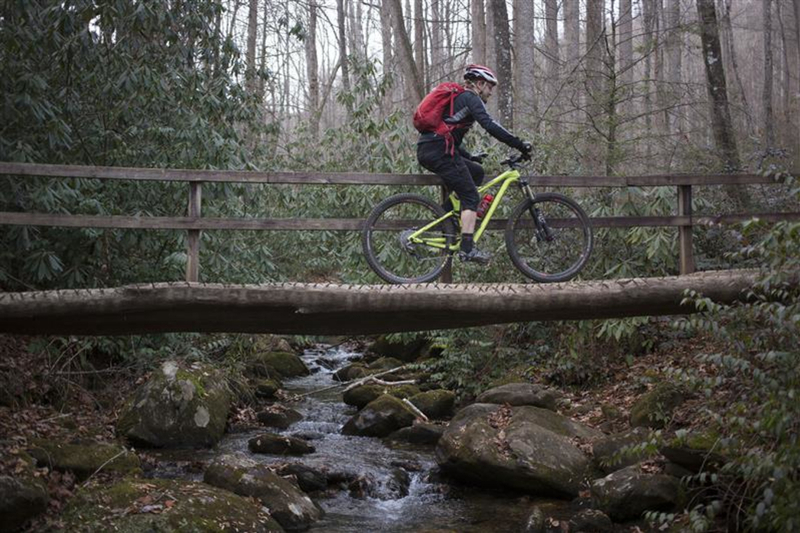 If it’s a hot summer day, or if it’s been raining recently, you can leave your bikes atop a steep spur trail and check out Cove Creek Falls on the way up. You’ll climb steadily, crossing several log bridges along the way that aren’t rideable by most mortals. Keep going up! When you reach an rocky uphill staircase feature, stay right and continue to follow Cove Creek until it meets a gravel road; this is FS 225B. Take a left onto 225B and… climb some more. When you reach an intersection, take the uphill road bed to your right behind a gate and keep climbing. After 10 more minutes of climbing, this old road bed ends abruptly at a small clearing, and a short singletrack trail leads back downhill. This connector will take you to Daniel Ridge. 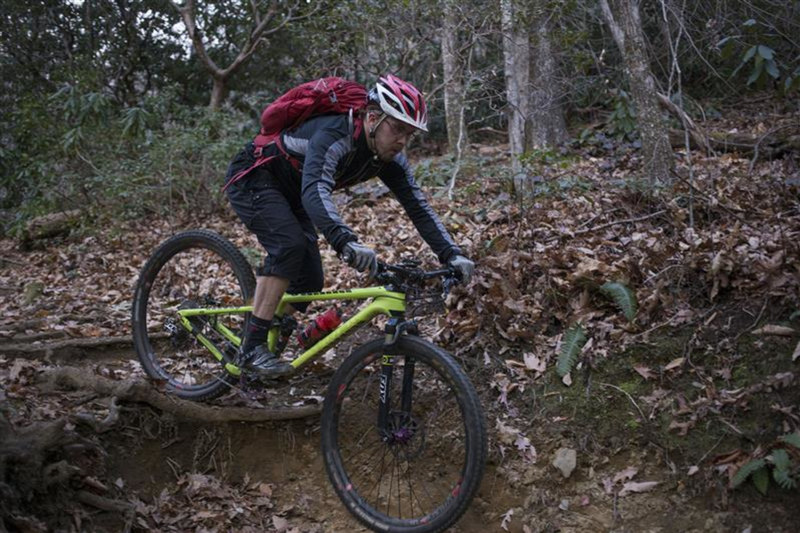 Lower your seatpost or activate your dropper; this ride is about to get fun. Charge down the connector trail, which features some loose rock and several water bars, until reaching the junction with Daniel Ridge Trail (TR 105). While either direction will take you back to the bottom of the Daniel Ridge Loop, we’ll stay right and take the west side of Daniel Ridge, which is the more technical and fun of the two. 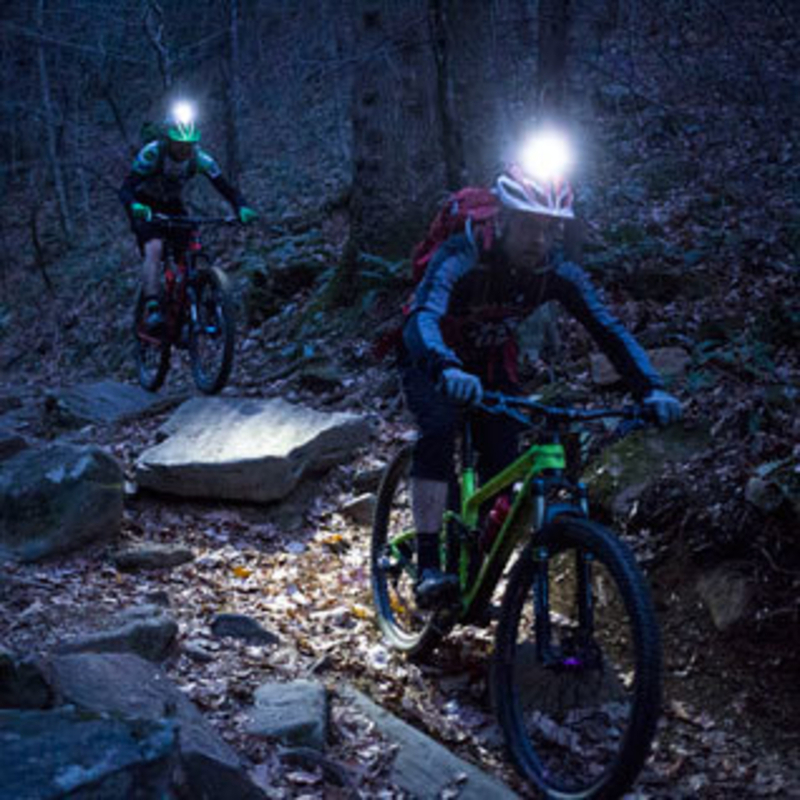 An old Pisgah MTB guidebook suggests riding the Daniel Ridge loop clockwise, but you’ll want to take our word on this one. CCW is where it’s at. Daniel Ridge starts to descend quickly at this point, with rooty obstacles and some tricky rock gardens. A short section here with multiple drops and a pair of switchbacks marks the most technical point of the ride; the trail is narrow and technical, and the lines require your full commitment. After an eroded right-hander with a large water bar at the beginning, a series of rooty step-downs dumps you out into a wider section of trail. From here, the trail climbs gently before crossing a small spring and reaching a junction. This is the bottom of the legendary Farlow Gap Trail, a larger adventure for another time. Stay left here through a long, sweeping turn to remain on Daniel Ridge. The trail surface is wider but no less tricky, with lots of loose rock and mid-sized rock obstacles. Choose your lines carefully; many riders will need to dismount for an obstacle or two. After a loose, rocky chute, the singletrack ends at an old road bed. Stay left again, and enjoy a pleasant descent along the Right Fork of the Davidson River before reaching the FS 137 gravel at the bottom of the Daniel Ridge loop. 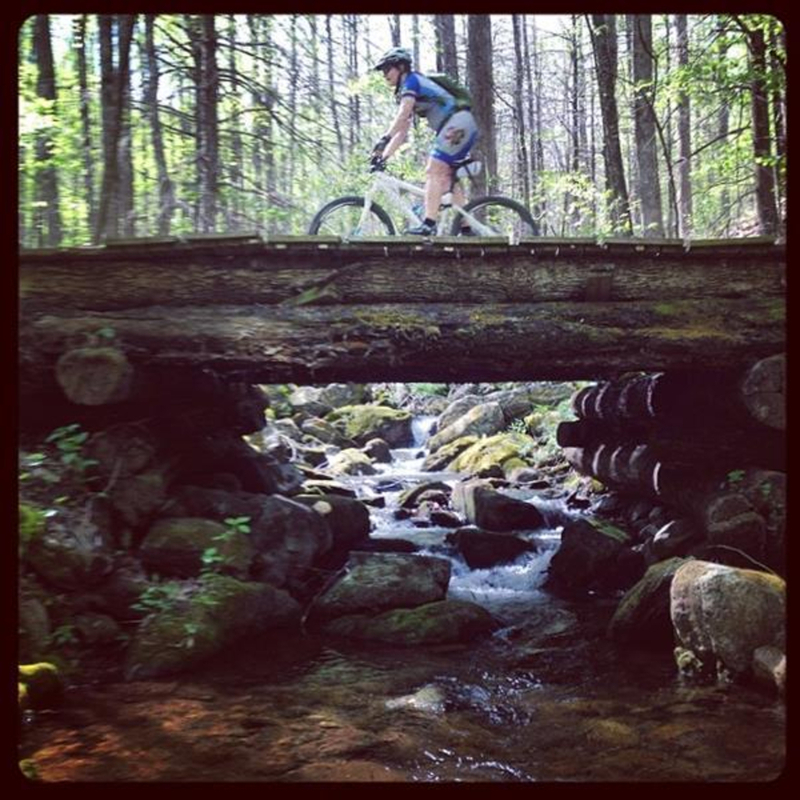 Cross over the picturesque steel arch bridge, then take a left when you meet back up with FS 475 – grind a little more gravel, use Davidson River Trail again (on your right!) to bypass the road, and cruise back to the Hatchery from there. 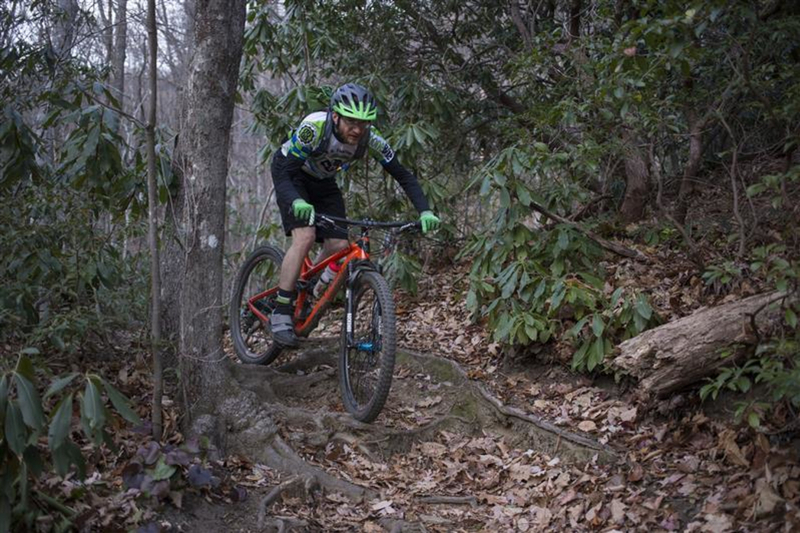 Cove Creek is a fun downhill for beginner mountain bikers, and Daniel Ridge can be ridden as a short loop on its own, the combined Cove-Daniel loop is a must do for intermediate riders. The Bobby N. Setzer State Fish Hatchery is also the site of The Pisgah Center for Wildlife Education, which you can find at 1401 Fish Hatchery Rd., Pisgah Forest, NC 28768.